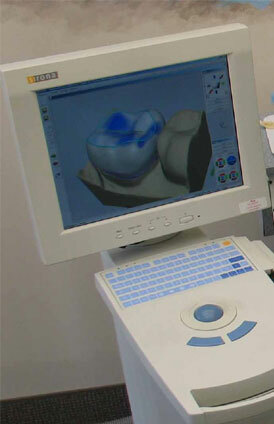 The system is a German manufactured CAD/CAM system called Cerec 3. This system allows Dr. Winkler to control the delicate process of creating the perfect tooth and restoration and replaces the need to wait two to three weeks or longer for an outside lab to make a crown, onlay, inlay, or vaneer. 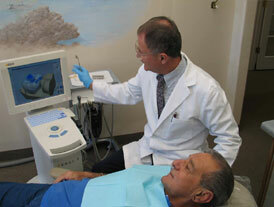 With the Cerec 3, Dr. Winkler can fabricate restorations in one visit while the patient is waiting. Cerec restorations are made from ceramic -- a natural substance that is particularly compatible with the body. The cerec ceramic has the same characteristics as normal, healthy teeth. The cerec tooth is not sensitive to hot or cold coffee or ice-cream. Furthermore, the ceramic is so smooth that bacteria do not adhere to it. There is no metallic taste as no metals are used, thus eliminating the unsightly metal ring at the base of the tooth and any metal allergies. Dr. Winkler is a dental implant specialist. Dental implants can provide permanent, stable, attractive replacement teeth for a lifelong smile. Dental implants are affordable and the procedure is easily and comfortably performed. Dental implants are an effective way to replace missing teeth. When teeth are lost because of disease or an accident, dental implants may be a good option. Many people choose implants to replace a single tooth or several teeth, or to support a full set of dentures. Implants offer firm support to man-made teeth. Dentures, bridges or single teeth attached to the implants won't slip or shift in your mouth- a very important benefit when eating and speaking. Dental implants are made of titanium (a strong, lightweight metal) and other materials that are well accepted by the body. Please contact our office so that we may answer your questions about these procedures, and of course you are welcome to come in and speak with Dr. Winkler.